Garris Behavior Check! • Bearded Dragon . org . Ok, I received my beardie from my friends and she has moments where it’s on and off low activity. I’m assuming it’s like having something to do with brumation. It occurs more often with lower temperatures outside. I have to fight to temp regulate her terrarium and my bedroom. Right now, I believe she is about to shed. Patches of her scales are dull colored. There’s like no indication she’s ready yet, but I think she’s having difficulties o __o; there’s plenty of surfaces for her to scratch on, but the areas are on top of he me head and her leg. She’s pretty healthy size too so I’m not too worried that it’s a concerning health issue. I changed her diet and I’m incorporating more vitamin B... but like. Idk. She’s also been glass surfing a LOT and it’s concerning me. Her beard grows black when it happens. I don’t think there’s any like... environmental issues. Idk. Any input would be great to ease my worries. Thank you! 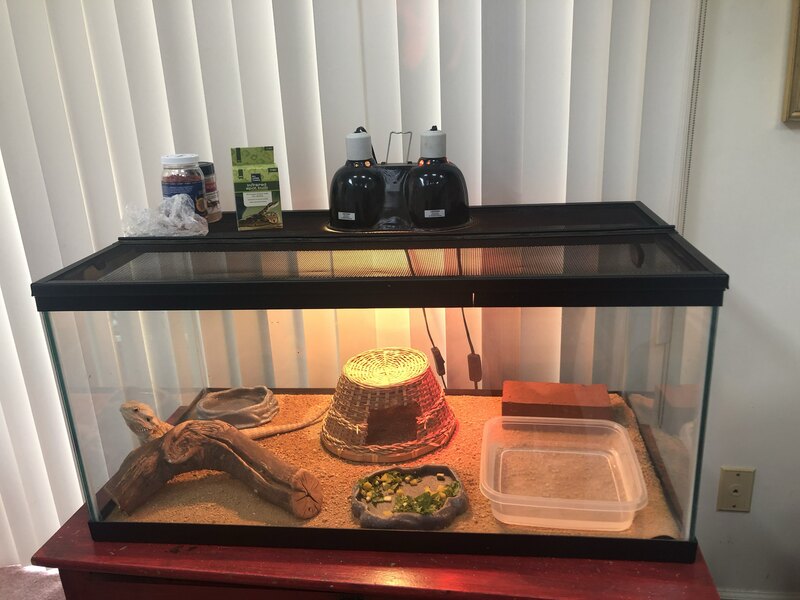 Please post pics of her tank and lighting -- her glass surfing could have something to do w/ the lighting -- we need to rule that out first --- what size tank do you have her in? KarrieRee wrote: Please post pics of her tank and lighting -- her glass surfing could have something to do w/ the lighting -- we need to rule that out first --- what size tank do you have her in? I would change out that lighting. For basking, go with something bright white. I like using PAR38 halogen flood lights from the hardware store, but those are getting harder to find. As far as the reptile store ones go, avoid neodymium coatings. The ZooMed Repti Basking Spot light is decent but they don't last very long so get a few to have on hand for sudden burn outs. The wattage you use depends on the surface temperature readings so you may need to try a few out before you have it just right. Which UVB light should I use? The best UVB light is a ReptiSun 10.0 fluorescent tube (Or Arcardia 12% in the UK). Compact or coil bulbs do not emit the proper amount of UVB light for a bearded dragon, and should not be used. Other brands, such as the Zilla Desert Series and ReptiGlo have been known to cause eye problems and other health issues with bearded dragons, and should be avoided. The reason that some UVB lights (Zilla, ReptiGlo, coils/compacts, ect.) are considered dangerous is because the wavelength of UVB that they emit is shorter and more intense than the wavelength of the "safe" lights (ReptiSun, Arcadia). UVB lights should be replaced every 6 months. **Note: Fluorescent light bulbs contain mercury, so you shouldn't throw away your used ReptiSuns. Take them to a facility that will dispose of them for you. Some hardware stores such as Home Depot may take your used bulbs for you.